It's Christmas, the festive season. Traditionally a time for mince pies, christmas pudding, turkey, stuffing and christmas cake. But what about a wheat free or gluten free Christmas? Do you have to miss out because you have a wheat allergy, intolerance, or celiac disease? 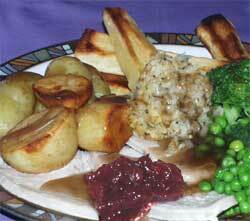 Everything for a traditional Christmas lunch can be reproduced in a wheat or gluten free version. Nobody needs to miss out, and nobody will know the difference (if you don't tell them). IMPORTANT: always check ingredients, manufacturers do change recipes without telling consumers, so don't assume the item you bought to eat last month will have the same ingredients this month, it may not.